AMMONNEWS - Jordan said on Tuesday more talks with Syria were needed before an important border crossing shut for three years as a result of its neighbor's war could reopen to serve regional trade. Damascus, which retook the crossing from the opposition last July, hopes to reopen the Nassib route because it is vital to its hopes of reviving Syria’s shattered economy and rebuilding in territory under its control. But Foreign Minister Ayman Safadi said technical committees between the two countries which began talks in the middle of September were still working out the practical arrangements. "The border will open after the technical committees end all the necessary arrangements and measures needed to guarantee opening the borders serves the common interests of the two countries," Safadi said after talks with his Lebanese counterpart. Western diplomatic sources say staunch U.S. ally Amman is resisting Russian pressure to open the crossing as this would help Damascus show the war is ending and hand President Bashar al-Assad another major gain. Backed by Iran and Russia, Assad's army has retaken control of most of Syria. Jordan supports Washington and its Arab Gulf state allies in their tough stance toward Iran, a country Jordanian officials are wary of because of its growing military presence in Syria. Jordan has denied it agreed on a date to reopen the crossing after Syria announced on Sept. 29 that movement of traffic and goods had begun. 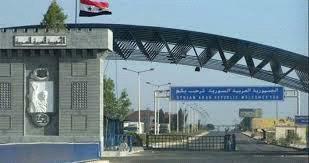 Syria retracted that announcement later that day, saying it would reopen on Wednesday October 10. Diplomats and officials have privately said the move appeared to signal mounting pressure by Damascus on Amman to speed up the opening of the crossing. Earlier, the Syrian authorities had said they had rehabilitated the crossing and it was ready to receive Syrian refugees. Lebanon's Foreign Minister Gebran Bassil in his visit to Amman lobbied Safadi for a speedy reopening, saying it would be a step toward stability in the war-torn country. "There is big hope that Nassib opens soon so that traffic goes back to its former strength," Bassil told reporters. Lebanon's economy minister told Reuters in July the crossing was "a vital artery" for the Lebanese economy where it is a conduit for millions of dollars of exports of fresh produce to lucrative Gulf markets.